Two rallies were held in Anchorage on Saturday: one featuring Sarah Palin and another protesting her nomination as vice president. 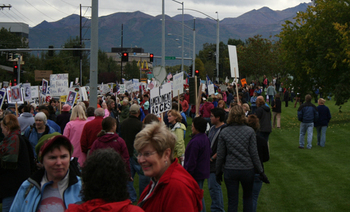 The Anchorage Daily News reported about 1,500 people at each event, including about 100 pro-Palin people at the protest, many egged on by a hate radio show host who called the organizers "socialist baby-killing maggots." Who knew that Zeb Bell has a twin in the far North? Here's a photo of the Palin protest from Mudflats, the go-to source for progressive Alaskan coverage of the Sarah Palin saga. Read a report on both events and see more photos here. In addition, here's the Anchorage Daily News' coverage of the anti-Palin rally and the VP nominee's appearance. It's certainly interesting that in Alaska, where Palin is supposedly wildly popular, a rally protesting her position on the VP ticket drew at least as many people as a rally featuring Palin herself. But then, as one Alaskan told the Anchorage newspaper, "This election is too important be left to the smears, trivial issues and lies McCain and Palin are trying to make it into. The myth (that) either McCain or Palin are mavericks, bringing reform and fresh air into Washington, it's nonsense." Also, this morning, I got an email from a normally apolitical cousin of mine in Illinois who told me two weeks ago that she believes all politicians are pond scum. But she was unnerved enough by last night's display of GOP arrogance and lies that she forwarded a fact-check round-up of the Republican speakers. I'll post that in the comments, since it's pretty long. You might want to send it to your friends and family, too. Then choose one point and write a letter to the editor. Update: It turns out the fact-check memo I got from my cousin was this story from the Associated Press. We'll be live blogging Sarah Palin's speech to the Republican National Convention, which is set around 8:20 Mountain tonight. Mitt Romney is on now, followed by Rudy Giuliani and Mike Huckabee before Palin. Feel free to start posting comments anytime, while I put up a few links of interest about Sarah Palin. Sarah Palin was for the Bridge to Nowhere before she was against it. 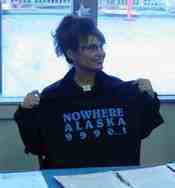 As mayor of Wasilla, she apparently tried to ban a bunch of books. Sarah Pallin, corruption fighter? Then what was she doing running Ted Stevens' PAC? Remember when we thought the Rev. Jeremiah Wright was a loose cannon? Get a load of this Huffington Post story by Nico Pitney and Sam Stein, detailing how Palin's worldview was shaped at the Wasilla Assembly of God. Ed Kalnins, the minister there, told parishioners in 2004 they might be damned to hell if they voted for John Kerry, and this past June he said (with Palin as a co-speaker), "I believe Alaska is one of the refuge states in the last days, and hundreds of thousands of people are going to come to the state to seek refuge and the church has to be ready to minister to them." Sarah and Todd Palin have longtime ties to and sympathy for the Alaska Independence Party. Todd, now "undeclared," was a member until 2002. In 1994, its founder's remains were found wrapped in a blue tarp and duct tape after a plastics-explosives sale went bad. As Kagro X wrote at Daily Kos today, "Nobody has more questions about this? About the Palins' having been fellow travelers with separatist party types who get killed in plastic explosives deals right in the militia movement/Waco/Ruby Ridge/Oklahoma City historical sweet spot? It's not like Republican militia-phile ciphers haven't made it as far as DC before, you know. Steve Stockman, anyone? Helen Chenoweth?" Of course, Sarah Palin won't mention any of this tonight. She'll hit a home run with the GOP faithful in the convention hall, and she'll endear herself to the "security moms" who helped re-elect George W. Bush. We must let everyone know: The Sarah Palin we see tonight is not the full story. The Sarah Palin we see tonight does not represent mainstream America. Not even close. And John McCain didn't know it. Update: Here's a speech postmortem from Bill Burton of the Obama campaign ... "The speech that Governor Palin gave was well delivered, but it was written by George Bush's speechwriter and sounds exactly like the same divisive, partisan attacks we've heard from George Bush for the last eight years. If Governor Palin and John McCain want to define 'change' as voting with George Bush 90% of the time, that's their choice, but we don't think the American people are ready to take a 10% chance on change." Also, here's an even more exhaustive list detailing McCain's Palin Problem. By rights this should be a good week for Republicans, or so one would think. As the MSM begins openly speculating that John McCain may be compelled to replace Sarah Palin a la Thomas Eagleton, no less than longtime GOP operative Peggy Noonan was quoted in one of those ever-popular open mic episodes as saying, "It's over." Meanwhile, Obama widens his lead in Iowa and Minnesota. New Mexico, which I consider to be one of three crucial Western states (Nevada and Colorado are the others), is now squarely in the "leans Obama" column. In all seriousness, when was the last time Republicans lost ground like this during the week of their own convention? No one should be under the delusion that Obama has this sewn up by any means, but clearly this is becoming more and more his race to lose.